NOTE | Segregation will be in place, Darlington fans are asked to enter at the Plessey Road end of the ground, Blyth fans at the Social Club End. 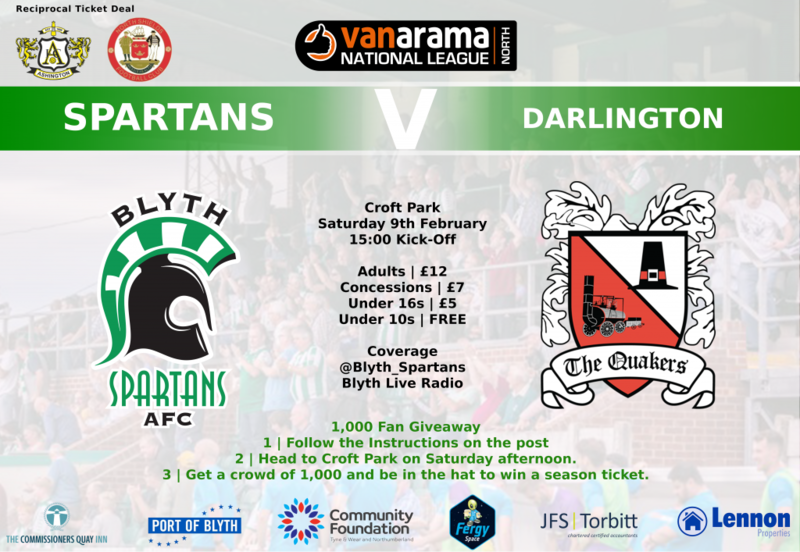 Blyth Spartans will look to end a run of four games without a win in all competitions when Darlington visit Croft Park this Saturday in the National League North. Alun Armstrong’s side have dropped to 11th in the table on the back of a 3-2 defeat at the hands of Hereford, whilst the sides around them were in action last weekend as Blyth lost 1-0 at National League leaders Leyton Orient. Blyth are just three points of the playoff sports and have games in hand on the three sides above them, a win this afternoon could lift Spartans as high as 6th – they would have to win by 16 goals for that to happen, however. 10 of last weekend’s starting XI were rested in Tuesday night’s Northumberland Senior Cup exit at the hands of Newcastle United U23’s – Kieran Green the only player to feature at Whitley Park. A season that showed so much promise early on has turned into a disaster for one of our nearest rivals. They currently sit 18th in the National League North having won seven, lost 10 and drawn 11 of their 28 league games this season. The sides have met nine times since the Darlington became a fan-owned club and advanced up the pyramid from the Northern League. Spartans have picked up just the two victories against the Blackwell Meadow side – a 3-0 win the 2014/15 FA Cup run and last season’s 3-1 win at Croft Park. Tommy Wright started his third spell at the club on 20th October 2017, having had two previously as a player. He appeared for the club in the victorious FA Trophy final in 2011 in his second spell, and in total made 76 appearances for Quakers, scoring 21 times. After his second time at Quakers, the former Leicester and Barnsley player went on to appear for Corby Town as player-manager, helping them to win promotion from the Southern League to the National League North in 2015. He was appointed Nuneaton manager last season when they were near the bottom of the table, and helped them to a midtable finish. Ironically, his last game in charge of Nuneaton was a 2-1 home win over Quakers on 14th October 2017. As a player, he started his career at Leicester City, making 21 appearances for them, and after loan spells at Brentford and Blackpool, joined Barnsley in 2006. After a loan spell at Walsall he joined Darlignton for the first time in 2007, and in season 2007-08 was the club’s top scorer with 15 goals, but unfortunately missed the play offs because of injury. He was then transferred to Aberdeen for £100,000, but returned to Quakers in 2010 from Grimsby Town for his second spell. He appeared for the club in the victorious FA Trophy win at Wembley over Mansfield, and actually hit the woodwork three times in the final. He was released in the summer of 2011. Jordan Nicholson came to the club with an excellent goalscoring record in his career so far and has previously worked with manager Tommy Wright at Nuneaton. Jordan began his career as a reserve team player for Cambridge City, before a successful 2014–15 season in the United Counties League with Eynesbury Rovers. He joined Histon of the Southern League in summer 2015, where he scored 16 goals in the space of four months. He signed a contract with Peterborough United in 2015 and was loaned out to Nuneaton Town in August 2016 until the rest of the season but was recalled in March 2017. Jordan joined Nuneaton on loan again for the 2017-18 season when Tommy Wright was manager. Whilst at Nuneaton over two spells he scored 21 goals in 51 games. On 31 January 2018, he was recalled from loan and joined Barnet permanently from Peterborough, but then Barnet changed managers and he was loaned out to Brackley Town in March 2018 and played eight games for them. This season he has scored nine league goals. All 10 players rested in the Northumberland Senior Cup after last Saturday’s FA Trophy exit are available for selection.